View is looking west in Fresh Meadows at the Western Terminus of the Long Island Motor Parkway. What was the date of the aerial? 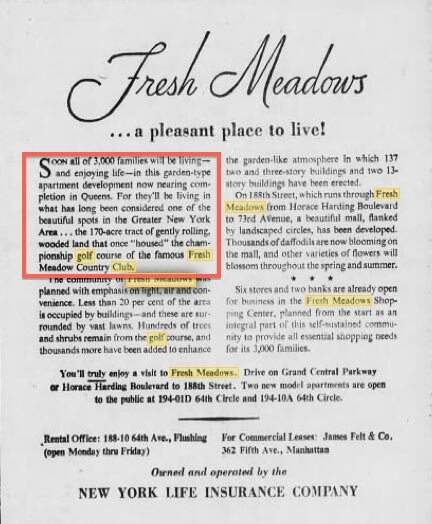 Congrats to Greg O., Tim Ivers, Steve Lucas, Art Kleiner (see Kleiner's Korner), Frank Femenias (see Femenias' Findings) and Michael LaBarbera for identifying the Western Terminus in Fresh Meadows location. Kudos to Greg O. and Frank Femenias for correctly answering every Mystery Foto question. The Western Terminus of the Motor Parkway. 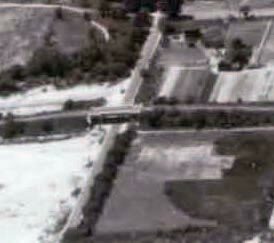 The Nassu Boulevard Lodge (never used) is a dot in this aerial. Fresh Meadows Country Club. 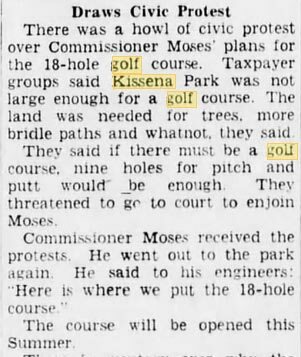 The course was designed by A.W. 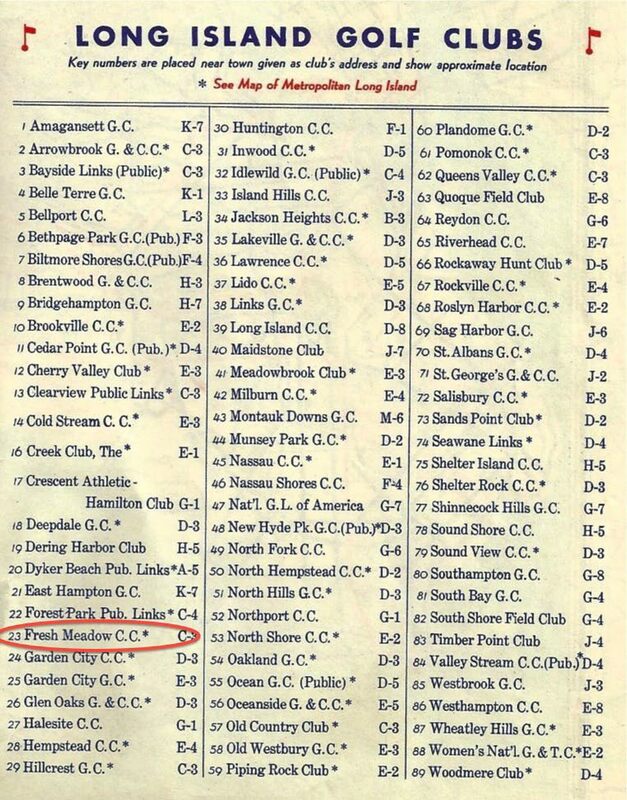 Tillinghast and was the site for the 1930 PGA Championship and the 1932 U.S. Open. 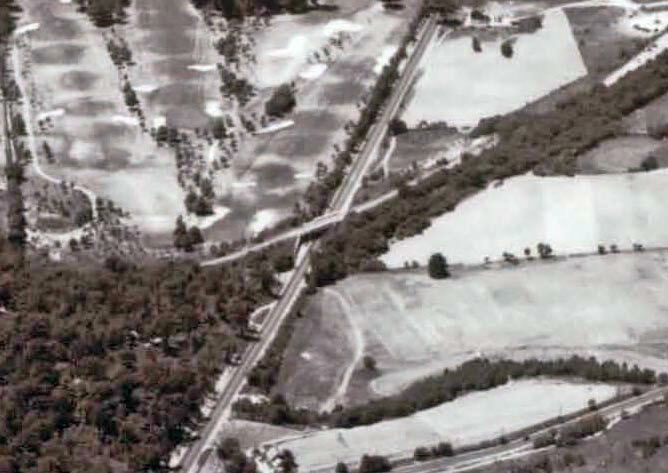 -The North Hempstead Turnpike Bridge, & the 73rd Avenue (Black Stump Road) bridge both built in 1926. This photo appears to be looking west with the photographer flying over the northern section of Cunningham Park. The LIMP runs left to right (south to north) with its western terminus at Horace Harding Blvd., the main road running from bottom to top through the center. LIMP structures include bridges over 73rd. Avenue and North Hempstead Tpke. The toll lodge (booth) at Horace Harding Blvd. could still be there although it’s tough to tell. Other main roads in the area include Union Tpke., Hollis Court Blvd., 164th. Street, and the northern section of Francis Lewis Blvd. 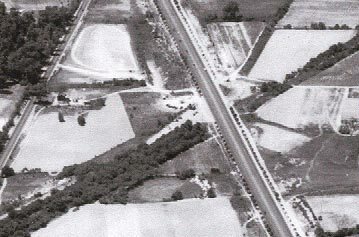 (under construction) although it was probably still known as Cross Island Blvd. at the time. 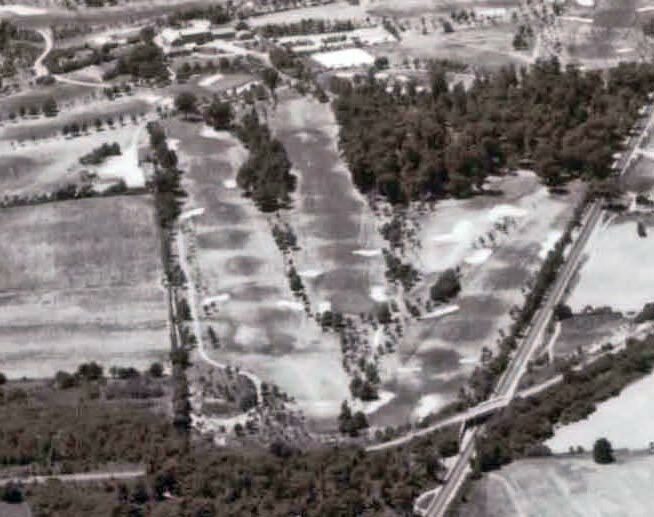 Besides Cunningham Park, other sports areas include the first Fresh Meadows Golf Course (opened in 1923) and the Fresh Meadows Golf Driving Range. Because of similarities between this photo and mystery photo #2 from earlier this year, I think they were both taken around the same date of June 24, 1938. 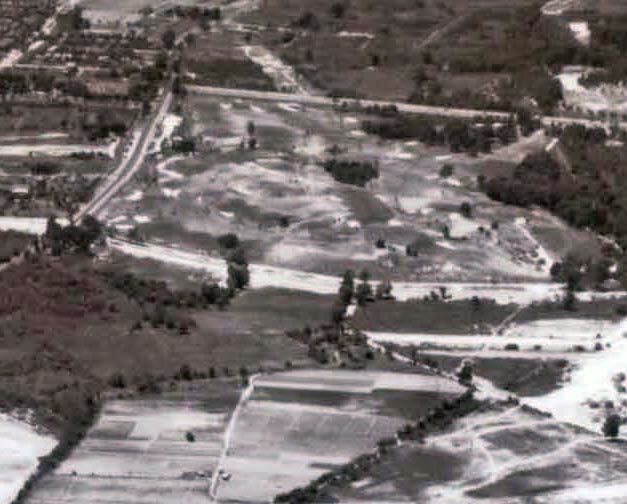 Identify the other major roads: Francis Lewis Blvd., Nassau Blvd. 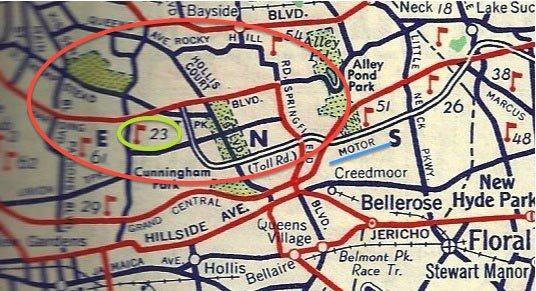 - North Hempstead Turnpike, Horace Harding Blvd., Hollis Court Blvd., Northern Blvd. Nice aerial, most likely another Fairchild. 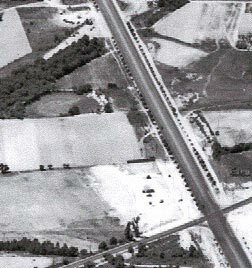 At center of roadway spaghetti is the LIMP western terminal, Fresh Meadow, NY, looking west, July 1939, closed for autos 1 year, opened for pedestrians/speedy bicycles. I see the toll entrance kiosk at center of LIMP roadway just south of Horace Harding Blvd (L.I.Expwy), also visible is the LIMP North Hempstead Tpke parkway bridge, the 73rd Ave (Black Stump Rd) parkway bridge, Hollis Court Blvd (intact), Union Tpke section on upper left edge, Central RR (abandoned) adjacent to the kiosk. 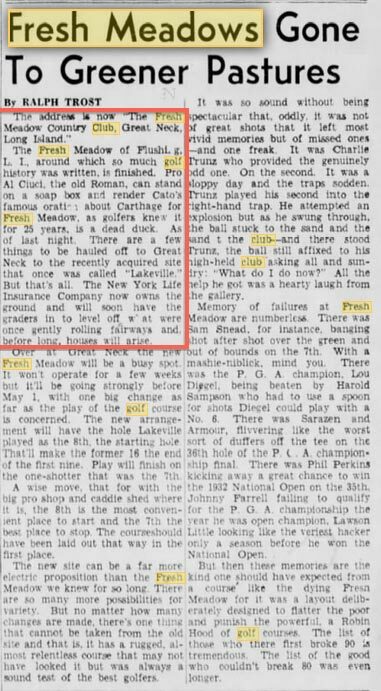 There’s Fresh Meadow golf (1932 U.S. Open) at N Hemp Tpke and 186th St, Tee-Off golf just south of Horace Harding Blvd and Hollis Court Blvd, Kissena Park golf at Booth Memorial Ave (N Hemp Tpke) and Fresh Meadow Ln, Flushing Meadow Corona Park (Valley of Ashes) boating at Meadow lake, and Holy Cow basketball yet to be. 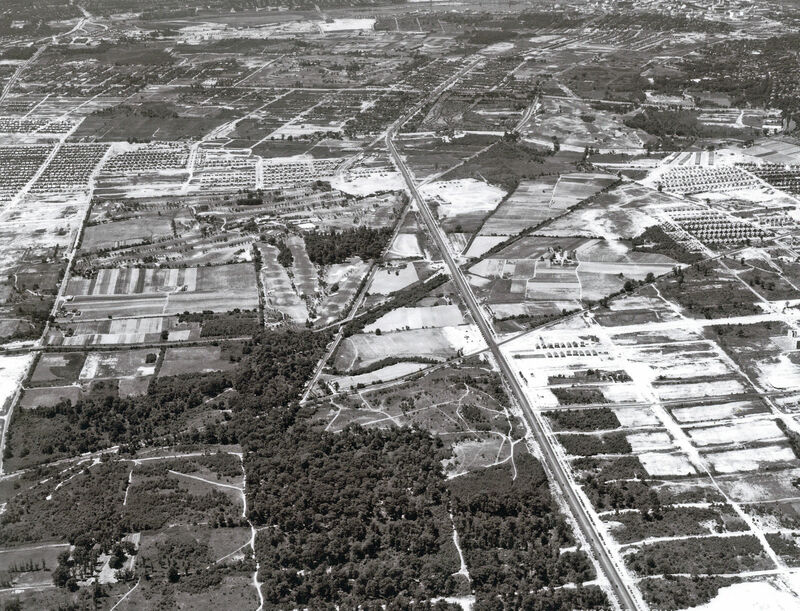 I would love to see a map overlay showing the Grand Central Parkway and LIE in relation to the old photo. So much has changed its still hard to imagine the picture and how it sits in todays landscape, and I was just in Fresh Meadows on Saturday !! Micheal - this website allows you to search for a location (i.e., 73rd Avenue, Queens, NY) and select two years you want to overlay. Using the slide or dissolve function you can overlay the two at the same time. 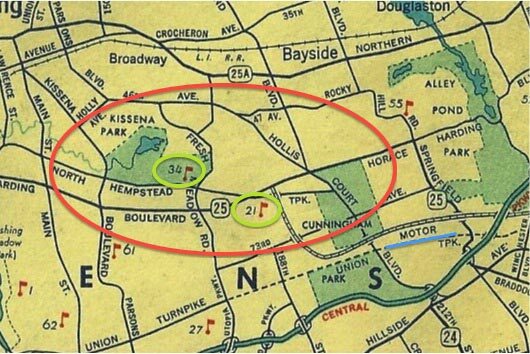 For this part of Queens I was able to overlay 1954 and 2013. Have fun! Still hard to tell because the picture faces west and the Historic Aerials site only allows north top south bottm orientation, but can anybody tell me if at the top right quadrant of this picture…. would that be St. Mary’s Cemetery ? Also Michael, I used Howard’s last photo of the expandable Mystery shot, then further zoomed in using simple Windows Photo Gallery software on the pc, and was amazed to see activity at Flushing Meadow’s Meadow Lake during the ‘39 World’s Fair at the top edge of the photo. These Fairchild aerials are by far the sharpest of the day. Thanks as always Howard for sharing these gems. Cheers to all. Hi Frank I did it in picture and fax viewer and saw boats on the lake, too bad the photo didn’t capture the Trilon and Perisphere, i guess that would have been more to the right after the picture ends. Mike, the greenway bike path was extended and now mostly connects all the area parks (Alley, Cunningham, Kissena, Flushing Meadow….). But to stay closest to the LIMP, it starts off the RoW at the bottom of the LIE pedestrian overpass (also part of the greenway path) hidden behind the school at LIE and Peck Ave, then winds around through Holy Cow Playground back towards Peck Ave (where the N Hemp Tpke bridge used to be located). There you’ll find the existing LIMP RoW next to the sidewalk. Brace yourself for a hilly, heavy downshifting adventure. Willie K made some of them pretty steep and choppy! Follow the path and have fun! Thanks Frank its good to know, im looking for some bicycle adventures and that area is so nice. The first time i was there was in November at a funeral at St. Marys Cemetery….little did i know of the history surrounding it. Last week i went to the Springfield Avenue Bridge (where the 2 ladies in the old mystery photo stood against the abuttment). Going up the ramp led to some beautiful terrain, and i can’t wait to explore it more. Howard, I think Michael’s photo in question may make a great mystery! Will do Frank, but it wasnt me at FM park though, I was in Cunningham Park and Alley Pond Park that day exploring the Hollis Tereace and Sprigfield Blvd. bridges.